One of the great mysteries surrounding the early years of Sailor Moon (and the characters developed for it) is around the character of Diana, the Moon Fairy who was to accompany Luna in her task of awakening Sailor Moon and searching for the Moon Princess. The fact that the name, Diana, was later reused for the daughter born between Luna and Artemis, and ChibiUsa’s post Luna-P companion, certainly makes matters all the more confusing when you try to look up information about her. And believe me, I certainly tried! So, what kind of character was Moon Fairy Diana originally supposed to be like, and what were the reasons for cutting her? Well, let’s find out! A cute fairy who’s mischievous, talkative, and sassy. Also a crybaby. Found by the Sailor Team among the ruins of the Moon Palace, she sticks around with Luna and Usagi. She and Luna don’t get along. She has pale blue wings with a light, lemon-yellow lace skirt. What we do know is that she and Luna would have had a bit of an antagonistic relationship with each other, probably akin to the manzai comedy acts2 which are so popular in Japan. More specifically, most acts are made up of a pair of comedians playing very specific roles: the boke – who’s portrayed as light-headed, stupid, and innocent – and the tsukkomi – who’s serious, easily angered, and doesn’t put up with the nonsense from the boke.3 Here, it’d likely be Diana and Luna playing those roles, respectively. So, why was it that Diana was cut from the story? While we’ll never really know for sure (at least without getting official word from Ms. Takeuchi, which seems unlikely this many years later), it’s most likely that she simply was too similar to Usagi. Just by reading the blurb about what her personality was meant to be like – mischievous, talkative, sassy, and a crybaby – there isn’t that too much that differs with Usagi. Also, while Ms. Takeuchi didn’t exactly steer clear from comedic moments (especially in the Codename: Sailor V manga), it seems that as the series progressed the characters had come more into their own and the idea of making Luna into a comedy-relief duo became less and less appealing. Read also: [Off Topic] How Deep Is the Car Connection in Magic Knight Rayearth? 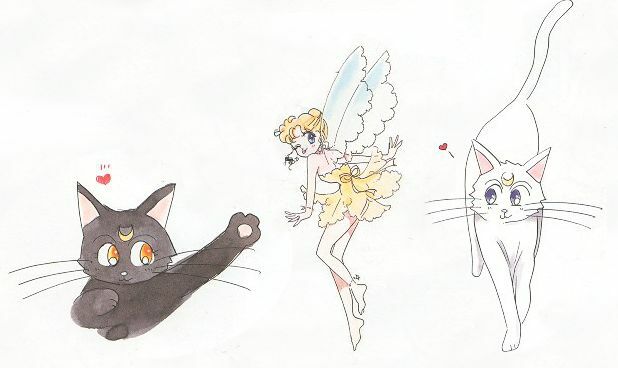 While it’s a shame that we’ll probably never really know what kind of character the Moon Fairy Diana was meant to evolve into, ultimately I think I like her successor – ChibiUsa’s feline guardian – better than what this character would have been. Still, though, I’d love to see more material that ultimately got cut! ← What Does Rei’s Name Mean? Yeah, ultimately, I don’t the Moon Fairy would have been very relevant to the plot. And Diana the cat is cute as a button and a good way to show continuity with “the next generation”. Chibiusa gets her own Luna, etc. To be totally honest? Diana the Moon Fairy sounds like Naoko’s take on Peter Pan’s Tinker Bell. While she may have added something interesting to the story, and I definitely would have been interested in how she fit in with life at the Moon Kingdom, ultimately I think the plot flows better without her. 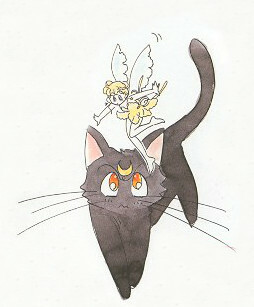 Luna being a cat allowed Usagi to take Luna with her everywhere without anyone being suspicious, but the fairy would either have to always stay out of sight, or otherwise be invisible.